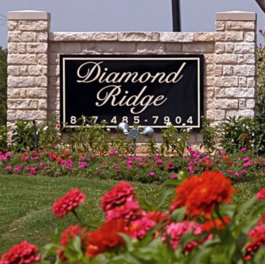 Located just off Loop 820 near DFW International Airport, the apartments at Diamond Ridge situate residents near a wide range of shops, restaurants and entertainment. The community is just across the street from Tarrant County College and minutes from the Diamond Oaks Country Club and Walker’s Creek Park. You can find the latest fashion and accessories nearby at North East Mall, with shopping destinations such as Macy’s and Nordstrom. Cool down on hot summer days with the slides and other water attractions at Bedford Splash Aquatic Center. When it comes to area dining, enjoy a savory and spicy breakfast from Taco Cielo, a local Mexican restaurant with authentic dishes for breakfast and brunch. From across the Pond offers delicious British food with a variety of delectable gluten-free options. The North Richland Hills location makes it easy to reach the fine-dining options in both downtown Dallas and downtown Fort Worth as well. To learn more about the area and the apartments at Diamond Ridge, reach out to a friendly member of the leasing team today.